FILE - An aerial photo shows several Boeing 737 MAX airplanes grounded at Boeing Field in Seattle, Washington, March 21, 2019. 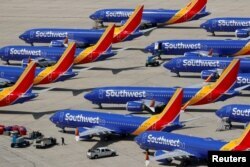 Southwest Airlines Co, the world's largest MAX operator, and American Airlines Group Inc with 34 and 24 MAX jetliners respectively, have removed the aircraft from their flying schedules into August. United Airlines said Monday it would remove its 14 MAX jets through early July. Airlines have said it is too soon to estimate the impact of the MAX grounding beyond the first quarter, but the extended cancellations signal that they do not expect a quick return of Boeing's fast-selling jetliner. The 737 MAX was grounded worldwide in March following a fatal Ethiopian Airlines crash just five months after a Lion Air crash in Indonesia. All on board both planes were killed. In a letter to employees and customers Sunday, American Airlines' top executives said they believed the MAX would be recertified "soon" but wanted to provide their customers reliability and confidence during "the busiest travel period of the year." "We've used spare aircraft and other creative solutions to help our customers, who had been scheduled to travel on one of our 14 MAX aircraft, get where they are going. But, it's harder to make those changes at the peak of the busy summer travel season," United said Monday. Meanwhile, operators have added a flight or two to other aircrafts' daily schedules and deferred some nonessential maintenance work. Some airlines are also weighing extending aircraft leases and bringing back idled planes, but with unclear MAX timing, no option is clear-cut or cheap, consultants said.